As mobiles overtake desktop usage and their number exceeds the world’s population, having a mobilised helpdesk centre is imperative. Learn the logic behind what makes a mobile remote access app effective for IT support and get tips on how to use the app to maximise your support experience. The benefits a mobile remote access app brings are extensive, but for current or aspiring tech support providers, three aspects of a remote support app should be of keen interest. First, you will be able to connect to end-users’ mobile devices and provide cost-effective remote support. Considering the fact that the number of mobile devices in 2014 was a staggering 7.4 billion with worldwide smartphone penetration approaching 2 billion and tablet adoption even surpassing 1 billion this year, the potential here is huge. Toss in the fact that most consumers aren’t quite sure what to do with a smartphone and a tablet, or how to maintain them, and it’s not much of a stretch to think that offering remote support for these devices is a smart decision. 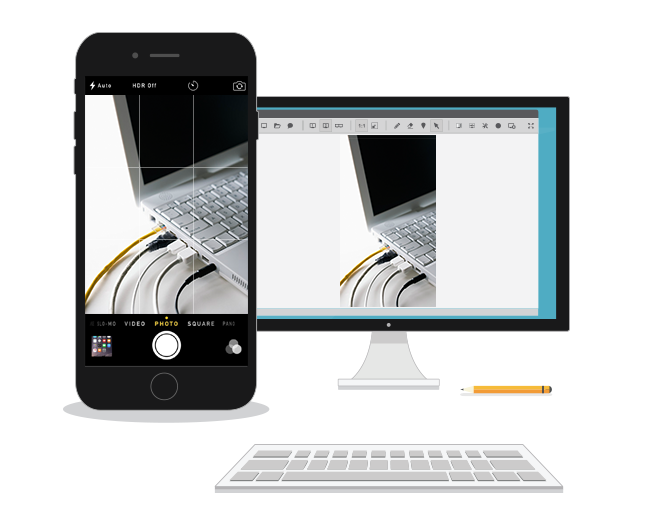 Second, the app increases mobile productivity as it lets you troubleshoot end-users’ desktop computer right from your connected mobile device. There’s a good chance greater flexibility at workplace and a possibility of telecommuting will draw in more qualified workforce for equal pay, as it’s more freeing, less time consuming, improves work-life balance and lifts an overall job satisfaction. 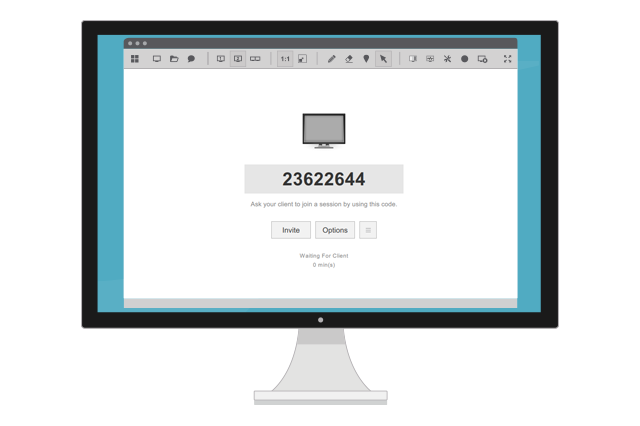 Third, the app will let you access unattended desktop devices from a tablet or a smartphone with a small end-user application installed on the remote side. This extends your ability to support your corporate or clients’ servers and desktop computers remotely even after normal business hours when no one would otherwise be there to help you connect. All three aspects seem to be equally important when it comes to assisting remote customers with IT issues in a mobile oriented society. However, to achieve the most in all three aspects, it’s absolutely crucial that you are able to successfully serve a large part of your public. Since the market is dominated by only two operating systems, the iOS and Android, which cover 96.3% of the smartphone OS market and 93% of the tablet OS market, finding a reliable remote access app that will always work on your and your clients’ iPad, Samsung Galaxy S6 or another mobile device is not a real challenge. The ISL Online remote support software, ISL Light, seems to have it all. Not only is it strongly established software for remote desktop support present since 2001 with multiple integration, customisation and management possibilities, above all its standard and premium functionality, but it also provides corresponding mobile apps for the both of the biggest mobile operating systems, the iOS and Android. Let’s turn the “what” question into “how” now and learn the easiest way to perform customer remote support with a mobile app. In our case, with the ISL Light app. How to support iPhones and iPads remotely with ISL Light? 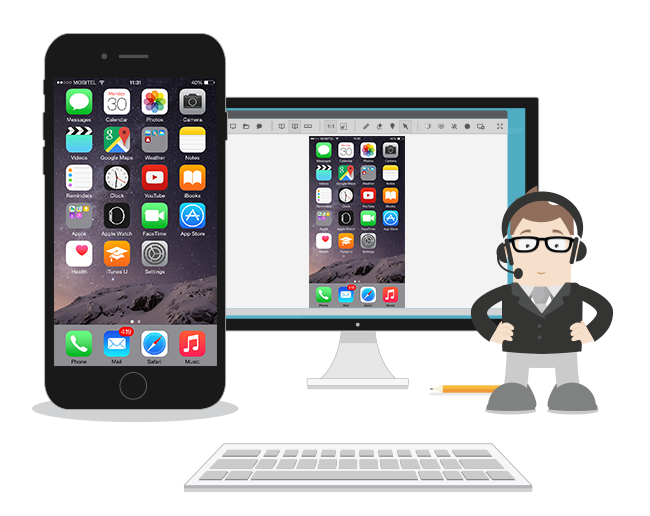 Upon receiving a new support request from your mobile client and forwarding it to an appropriate helpdesk operator, the operator initiates a new remote support session from a desktop computer (Windows, Mac, Linux). The operator runs the latest remote desktop software application ISL Light 4, logs in and clicks on the ‘Start new session’ button, which immediately opens a new window with a unique session code. In the meantime, the client downloads and runs the ISL Light iOS on their iPhone, iPad or iPod touch. Then, he/she joins the session easily by typing in the unique code and taping ‘Join session’. When connected, the operator can guide the mobile user through automated real-time screenshot and camera photos sharing, but not remote control as it’s currently subject to terms and conditions of Apple. To share the screen, the client takes a normal screenshot of the problem by pressing and holding the Sleep/Wake + Home buttons. A second later the screenshot automatically appears on the operator’s computer. 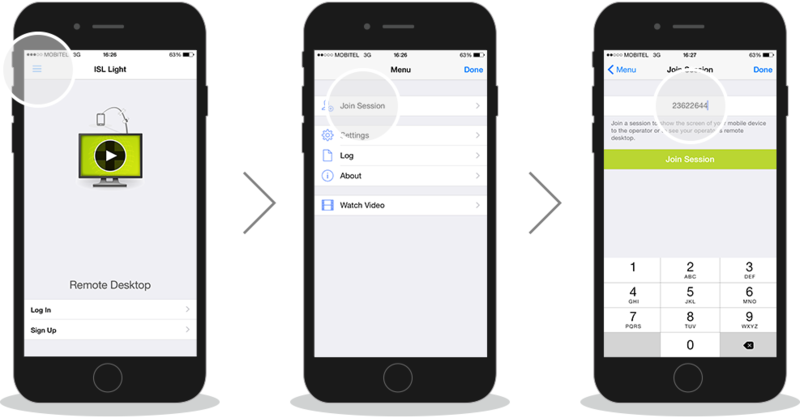 Photo-aided support is as simple as screenshot sharing, but instead of taking a screenshot, the end-user takes a photo, which is automatically transferred over the ISL Light app to the operator’s screen. 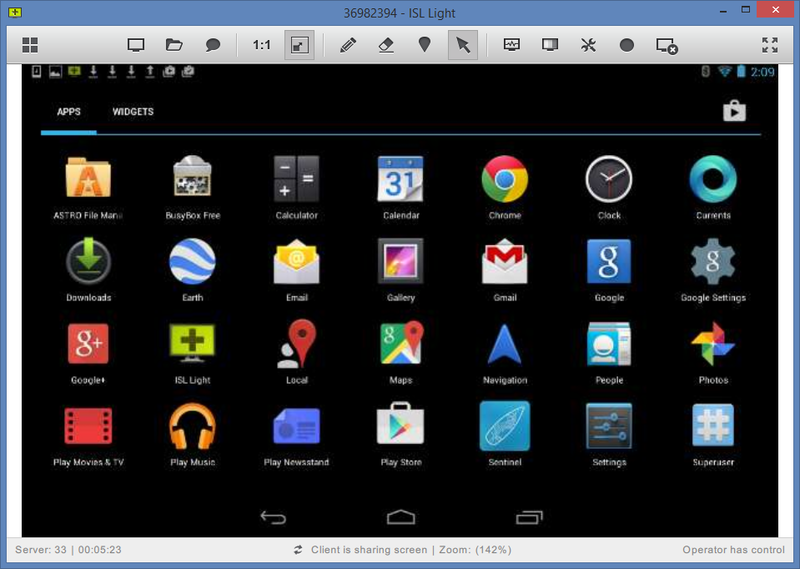 How to support Android mobile devices remotely with ISL Light? 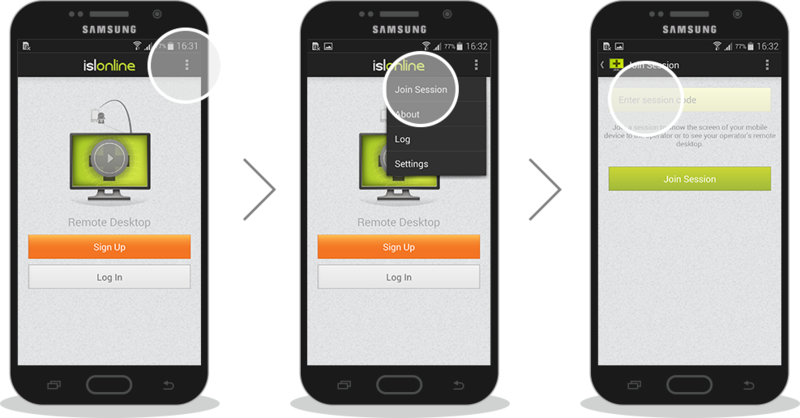 The ISL Online Android app empowers mobile supporters to securely access just about any Android phone and tablet, while it also, thanks to a tight partnership with the world’s largest IT company, Samsung Electronics, lets them fully control any Samsung device running on Android 4.2.2 or newer. To start a remote support session with an Android mobile user, the operator runs the remote desktop software application ISL Light, logs in and clicks on the ‘Start new session’ button, which immediately opens a new window with a unique session code. In the meantime, the client downloads and runs the ISL Light app on their Android device. The client then joins the session easily by typing in the unique code and taping ‘Join session’. When connected, the operator can securely control any Samsung device running Android 4.2.2 or newer, install or remove apps, manage running processes and text-chat with a remote user. Please see the video for instructions on how to control an Android mobile device from a remote computer. To share the screen on any other Android mobile phone or tablet, the client takes a normal screenshot of the problem (by pressing Volume Down + Power Off on most devices) with the screenshot automatically appearing on the supporter’s computer. Today’s support teams have access to amazing levels of technology. In addition, ubiquitous connected mobile devices and other tech tools are changing commerce, customer relationships and workflow, forcing organisations to adapt quickly in order to stay ahead of the game. Add it up and a smart remote support solution could be a game changer for either keeping pace with the best or getting left behind. You’re welcome to try ISL Online remote desktop for free. This entry was posted in Android, corporate remote desktop, cross-platform, iOS, ISL Light, isl online, IT support, Mobile, remote access, remote desktop support, remote mobile control, Remote support, Uncategorized and tagged access a remote computer, access android mobile device, access iPad, access iPhone, access mobile devices, android, business remote support, control mobile device, how to support android remotely, how to support ipad remotely, how to support iphone remotely, iOS, remote support for android, remote support software, remote work. Bookmark the permalink.